In April 2012, I got to go to Purl Soho in NYC, the store behind the Purl Bee blog. It was kind of bizarre seeing in-person the projects I had seen so meticulously photographed for the blog. Naturally, I treated myself to some fabrics. Since I was in the middle of a half dozen projects (most of them unrelated to crafts/sewing), I put the fabrics in the busted-up UPS box that serves as my sewing room. It’s pretty classy. 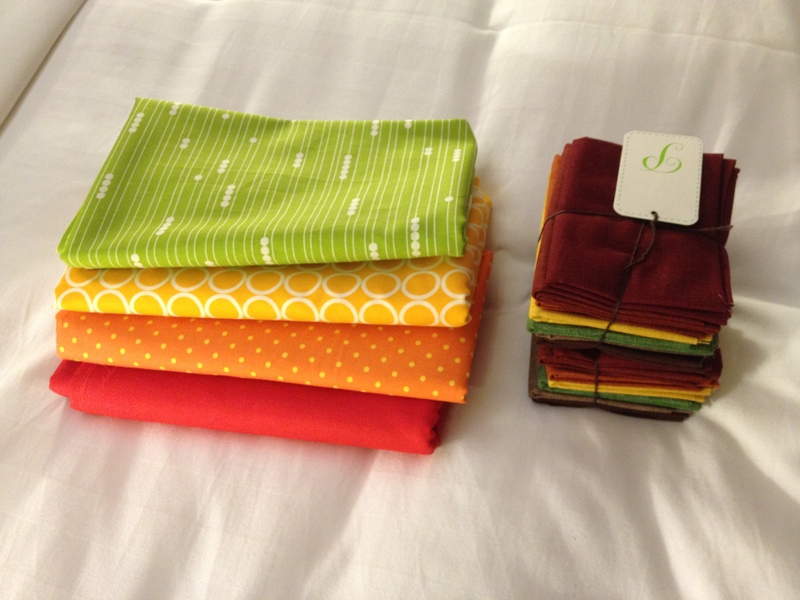 I love and am inspired by color, so of course I bought the fabrics before I had any idea how I would use them. I overbought for the bird quilt, so I decided to show more restraint in quantities when purchasing fabric from Purl Soho. 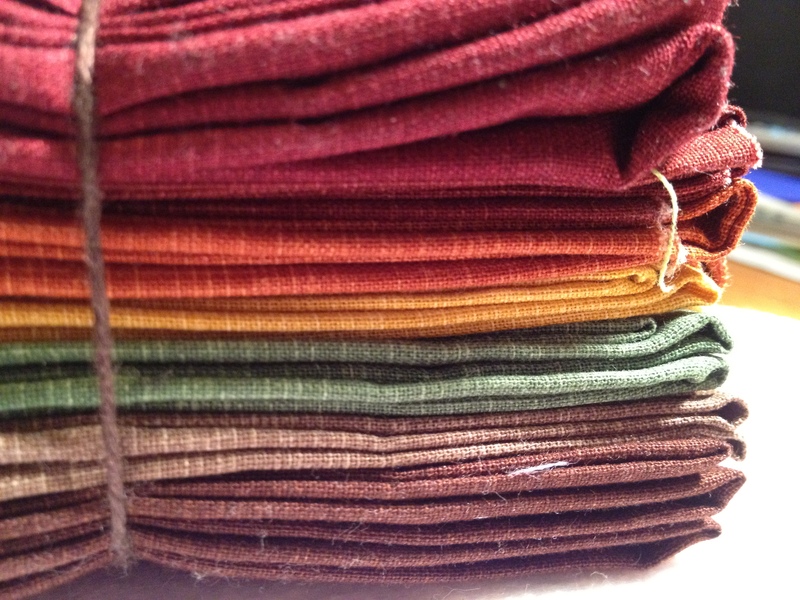 The result is I have a half-yard each of the 7 autumn colors and two yards each of the citrus colors. Fabric. Fail. What I needed was a way to stretch my fabric by supplementing with some kind of solid. So now I’ll do a variation on a Dear Jane quilt with my autumn fabrics, using a cream solid to tie the pieces together AND make the fancy fabric I bought go further. Even reducing the number of pieces by roughly half wasn’t enough to complete the quilt, though. See, I planned for fat quarters of 18 x 22″. 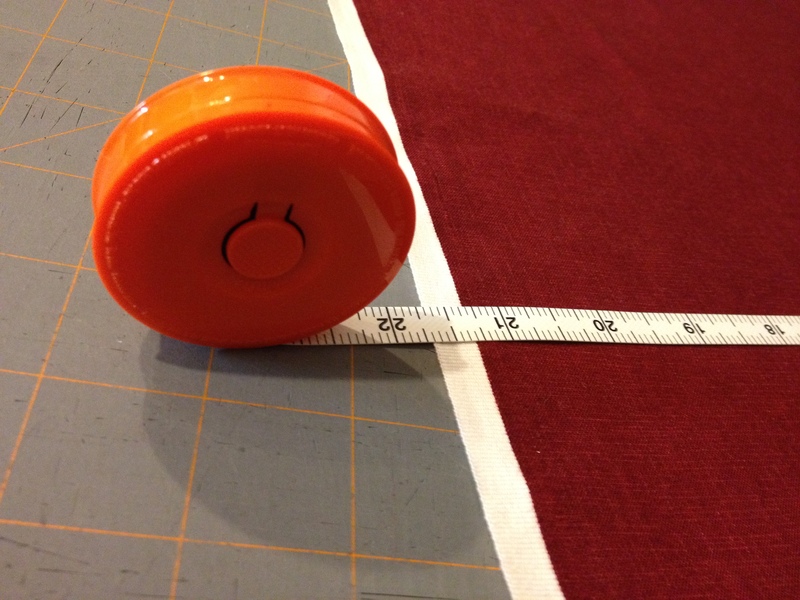 In hindsight, it’s obvious that the fat quarter dimensions don’t take into account selvage, crooked cutting or lazy ironing, etc. But it was a surprise when I first measured. My first idea was to buy a coordinating fabric and make some of the blocks from it. I did this, got it home, and was disappointed how poorly it matched the other fabrics. Then – DUH – I checked the selvage to see who the designer was. I quickly identified the fabric as Robert Kaufman’s Quilter’s Linen line. Which appears not to be a fabric being sold anymore this season. Ugh! Fortunately, I did find a website with most of the colors I needed. I only had two fat quarters of each color to begin with. Now I have an additional half-yard of each, so I’m back to over-buying! The best part of making quilts is the design planning. 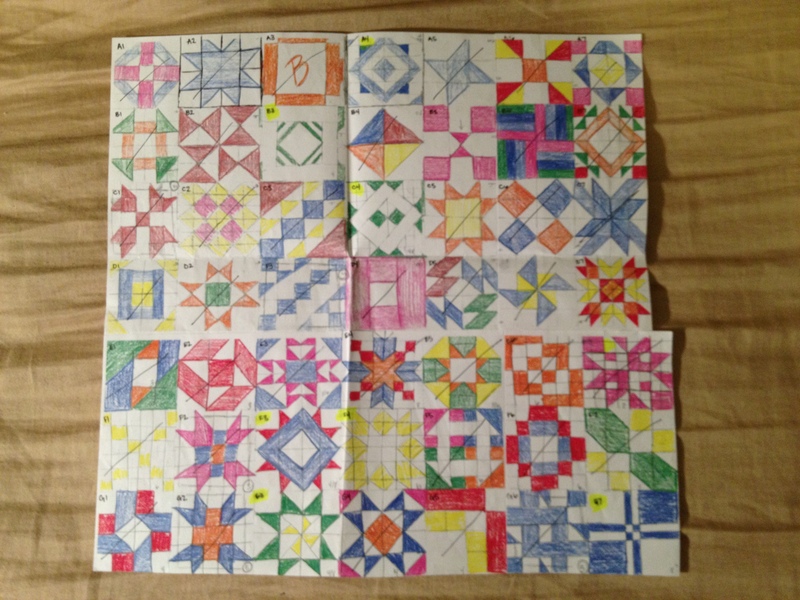 Below are sketches of the quilt blocks I plan to make. I used seven colored pencil colors that don’t really coincide with my fabrics but that are easy to distinguish on paper. The original Dear Jane quilt was sewn by Jane A. Blakely Stickle, finished in 1863. There are whole groups of women called Janiacs who follow Jane Stickle’s original pattern. I knew nothing about Jane or her quilt when I conceived the idea for my quilt. I wanted to put together lots of different blocks for variety. I searched for Pinterest photos of quilts with different block designs. Other pinners had these posted on boards with names like “Dear Jane Quilt.” Seemed pretty straightforward. I have heard of quilting bees where each person contributes a block toward a quilt, and I imagined a few of Jane’s cousins sewing quilt blocks (next to a warm hearth, of course) and mailing them to Jane for her project. After reviewing the history of her quilt and searching for images of Dear Jane quilts online, I can no longer tell whether the only Dear Janes are those that follow her original design or whether each quilter has some creative license. I hate sewing circles and isosceles triangles, so I gave myself permission to omit those designs from my quilt. I won’t do Jane’s border or scalloped edges. And my squares will probably be 12”. 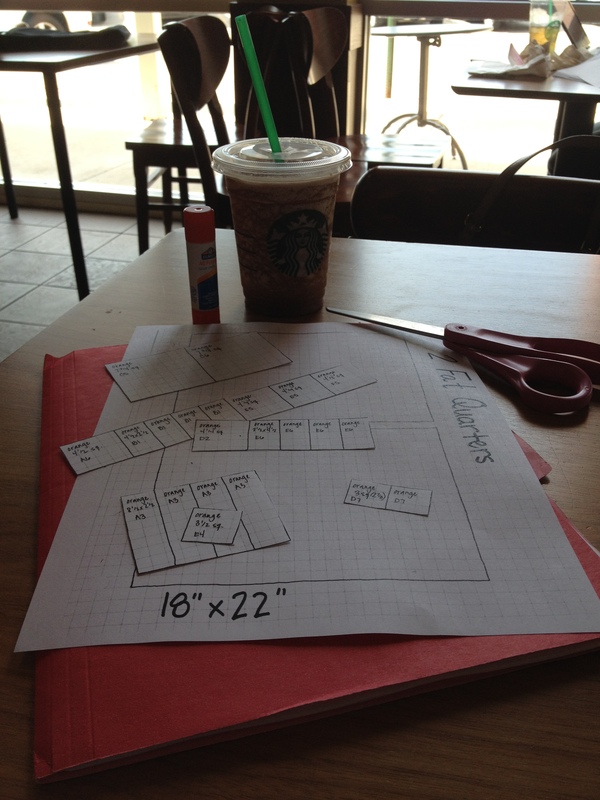 With quilt blocks using grids of 2, 3, 4, 5, and 6, 12” blocks will be easier to calculate than 8” or 10” squares. So I just found quilt blocks I liked and decided to call my quilt a Dear Jane anyway. Probably half the squares are “farmer’s wife” blocks. Mis-named with great excitement, I can’t wait to get started sewing! P.S. Please feel free to comment if you know whether Dear Jane quilts have to follow Jane’s original design. Categories: Quilts | Tags: autumn, bundle, dear jane, design, fabric, farmer's wife, fat quarter, grid paper, jane stickle, patchwork, purl bee, purl soho, quilt, quilt block, quilter's linen, quilting, robert kaufman, sewing | Permalink.